Fast-food workers in 160 cities nationwide went on strike today, including 50 workers from 14 restaurants in the Twin Cities. The strikers are demanding $15 per hour and union rights. The strike comes on the two-year anniversary of the initial “Fight for $15” action in New York City, which sparked a movement that has since spread across the country. After walking off the job early this morning, fast-food strikers staged a lunch-hour demonstration outside a Burger King in south Minneapolis. More than 100 people – striking workers and their supporters – occupied the store for about 10 minutes before marching outside and shutting down traffic at the intersection of East 34th Street and Nicollet Avenue. 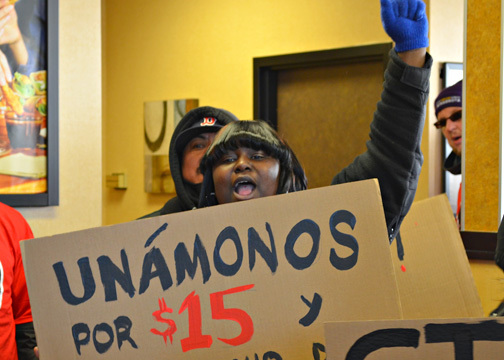 The “Fight for $15” is quickly catching on in the Twin Cities. The number of workers who walked off the job today nearly doubled the number of participants in the first Twin Cities fast-food strike just three months ago. A demonstration in support of striking fast-food workers shut down traffic on Nicollet Avenue in Minneapolis. 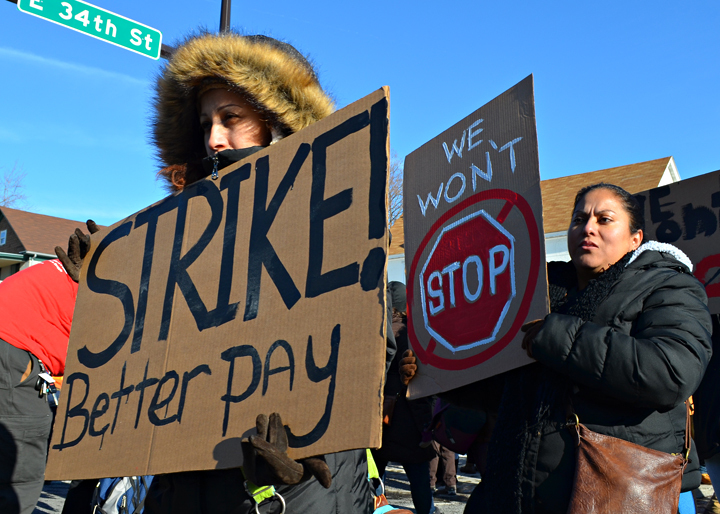 Eusebia Rosendo, who works at a McDonald’s in northeast Minneapolis, said she joined the strike because she’s seen just one 40-cent raise in six years with her employer. She currently works for $9 per hour without benefits. Rosendo marched alongside her co-worker Lourdes Rodriguez outside Burger King today. Rodriguez, who also earns $9 per hour, said she supports organizing a union so that workers can negotiate benefits like vacation, health care and paid sick days. Supporters at the demonstration included Minneapolis Mayor Betsy Hodges, religious leaders and members of several local unions. 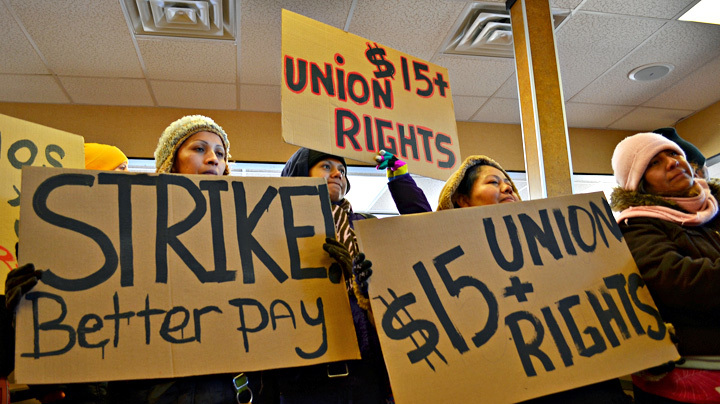 Striking fast food workers are demanding $15 per hour and union rights. Home care worker Bjorn Johnson, who won a union after SEIU Healthcare Minnesota‘s successful organizing drive earlier this year, urged fast-food workers to continue standing up – and standing together. Rosendo said the community support was encouraging.